Appraised values were, on average, 1.95 percent less than what homeowners estimated in April. 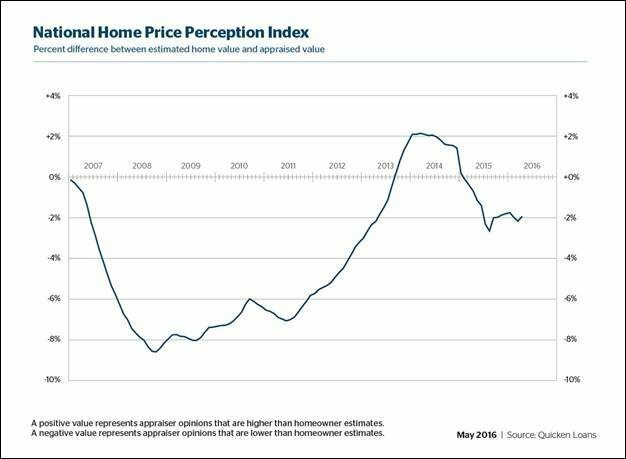 In March, appraiser opinions were 2.17 percent lower than homeowner expectations. Home values decreased 0.66 percent from March to April but increased 3.79 percent year-over-year in April. Foreclosure inventory declined by 23.2 percent year-over-year in March 2016. Completed foreclosures declined by 14.9 percent year-over-year. The number of completed foreclosures nationwide decreased year over year from 42,000 in March 2015 to 36,000 in March 2016.